introductory lecture-demonstrations and workshops focused on specific elements of dance, i.e. abhinaya, jathis, charis, karanas, etc. The traditional curriculum requires and builds discipline and enthusiasm for the art itself. Learning dance encompasses mastering theory and cultural background, as well. A student must first complete the Praveshika Certificate over 2 years. 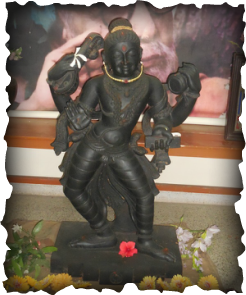 In the pedagogy of Bharata Nrityam, shlokas and exercises, prescribed in the Natyashastra, are paramount; they maintain and develop the students’ inherent flexibility. As students begin to settle into their practice of these, they begin learning the basic steps of Bharata Natyam. This method of training not only provides a solid foundation in the Bharata Natyam style, but also hones the dancer's body to easily adapt to any style of dance, be it Indian, Western or otherwise. The next 2 years, the student learns various dance items working towards a full repertoire. A salangai puja at the end of this period marks the completion of the Sangraha Certificate. Finally, the student is ready for the preparation for an Arangetram/Debut. Sage Bharata’s Natyashastra, at least 2500 years old, is the most comprehensive treatise on Indian theatre, which comprises dance, drama and music. It delineates the common classical--margi-- tradition, which coexisted with the regional--deshi--traditions, each mutually enriching the other. However, for centuries, study of the classical tradition became obsolete. Only in the last century have scholars revived academic studies of the Natyashastra’s tradition. During her doctoral research of karana sculptures at 3 main temples in South India, Padma Bhushan Dr. Padma Subrahmanyam discovered that each of the 108 karanas were represented by a different pose in each temple. From there, she referred back to the original Natyashastra text to find that a karana is in fact a movement rather than a static pose, as previously believed. Her reasearch was further validated by another scholar's work at Prambanan temple in Indonesia, where karana postures not found in South India (except in their careful reconstruction by Dr. Padma) were recorded in the sculptures there! 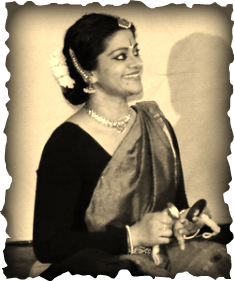 Using her pioneering research and ability to practically reconstruct dance as laid down in the Natyashastra, Dr. Padma has gone further and incorporated it into the prevalent regional style of Bharata Natyam, breathing new life into it. This style is called Bharata Nrityam.